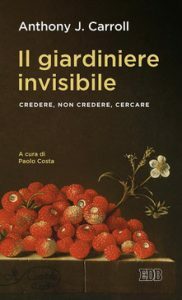 Il giardiniere invisibile: credere, non credere cercare, EDB, 2019. (The Invisible Gardener: Belief and Unbelief in Dialogue ). The Revd Dr Tony Carroll has published a new book which will be launched at Mirfield in June. The book attempts to think anew about the God-World relationship in the context of our Secular Age. It builds on the parable of ‘invisible gardener’, originally devised by the Cambridge philosopher John Wisdom in 1944, to think about how religious and non-religious people can enter into dialogue about God today. The book will be launched at the Mirfield Centre day conference on Ancient and Modern Insights into Human Flourishing on 3 June.